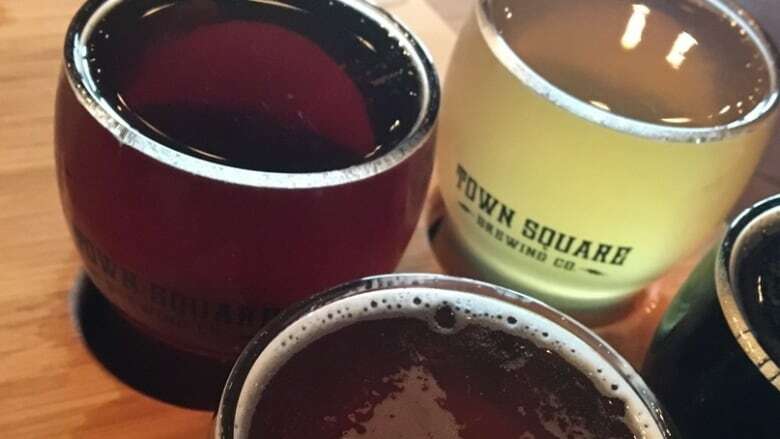 CBC food critic Twyla Campbell reviews the food and drink at Town Square Brewing. Town Square Brewing joined Edmonton's burgeoning craft beer scene in November, putting down roots in Ellerslie. Like the town squares of old, it could become the neighbourhood's central hub. After all, the brewery's website says: "A place for family and friends, colleagues and sweethearts to come together." The space is rustic but comfortable, with touches of barn wood and a warm glow from Edison lighting — inviting enough to make one want to congregate with colleagues or loved ones. 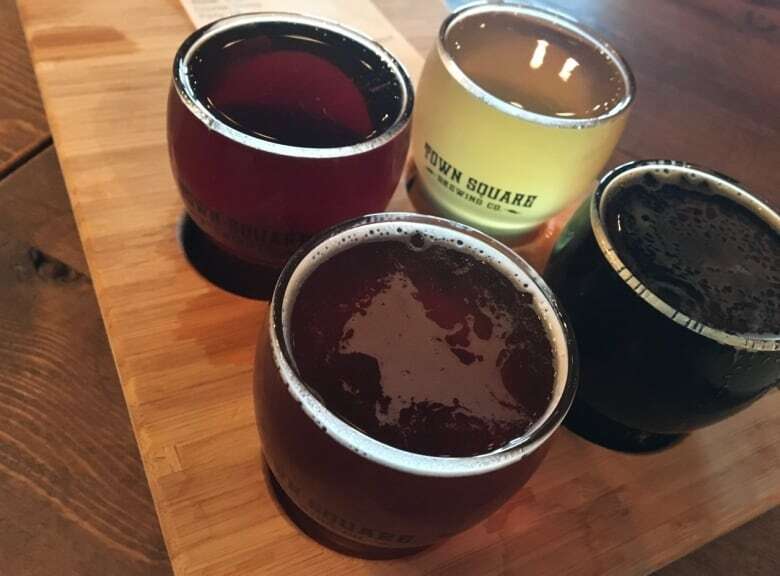 It promises to serve "palate-pleasing experiences" with locally-crafted beers, sodas and pizzas, but Town Square Brewing doesn't quite live up to its mission statement. There's hardly anything unique about calzones, chicken sandwiches and charcuterie boards. And the six pizzas and seven beers we ordered weren't particularly palate-pleasing. It seems the kitchen staff hasn't quite grasped the concept of temperature and cooking time, or cooking in general, as almost every item ordered was some combination of charred, dry, and greasy. The Call me Pablo pizza was flavoured with chimichurri, chorizo, red peppers, mixed onions and roasted corn, which was interesting enough. 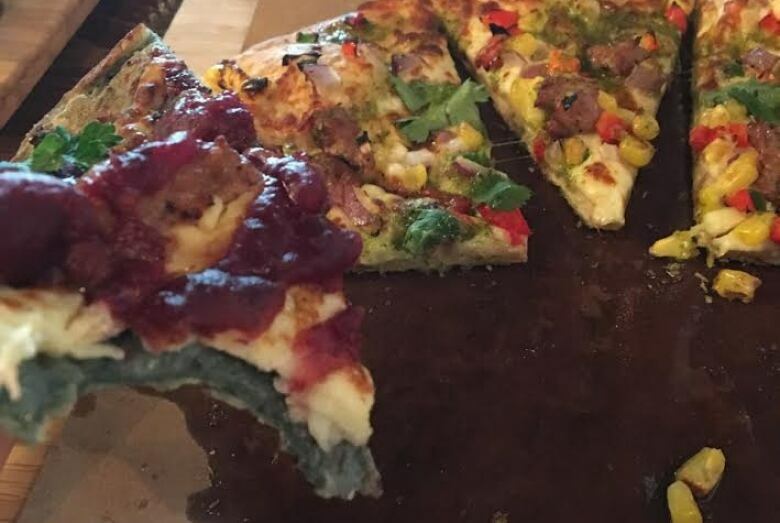 But the thin, charred crust couldn't support all those toppings. Within minutes, it was a disintegrated, sloppy mess. The kitchen-sink approach to toppings was the culprit again with the The Night's Watch pizza. The cranberry jalapeno jam was oddly appealing, but two proteins (confit chicken and chorizo) were overkill, as was the cornbread crumble. But it was the bluish-grey crust that was the most mind-boggling part of the pie. We were told the blue tint was the result of the addition of food colouring to the spent grain dough. You read that right: food colouring. Out of all the pizzas, the I am Root was the least offensive. It was quite pretty, and featured colourful sweet potatoes, onions, asparagus, tomatoes, arugula, feta cheese and balsamic drizzle. Yet again, it was too moisture-laden for the thin crust. With spicy genoa salami, soppressata, black forest ham, heirloom tomatoes marinated in basil, oil and garlic, diced onion, and mozzarella, the calzones looked good on the menu. If only they weren't so burnt they were inedible. The flatbread that accompanied a passable spicy chicken dip was also black and brittle, but the feta cheese topping described as "brûléed" (the French word for "burned"), was completely untoasted. Out of the nine beers on offer, the Forged Rye Amber Ale and the Rauchbier were the group favourites. The amber ale, though, had some interesting notes of caramel and nut with citrus on the nose. The Rauchbier featured smoked malt, giving it fair depth and character. All others fell short. They weren't memorable, unless being almost flat and flavourless is worthy of remembering. We had hoped the beer could salvage a dismal dining experience. It didn't. Located at 2919 Ellwood Drive SW, Town Square needs to call a town hall meeting — and quick.